Ah, the dungeon crawler: the original RPG genre. These days Atlus USA is the only one publishing these titles, with games like The Dark Spire and Etrian Odyssey. So far this series this genre had suffered from two big problems. The first is that none of the game released in this genre this decade have come close to the games that originated this genre. Games like Wizardry, The Bard’s Tale, the old SSI AD&D games and more. This genre was once the backbone of American PC gaming. It’s since all but become extinct on this side of the Atlantic, with the last remnants being made by Japanese companies like Success and the creators of Class of Heroes, Zerodiv, of which this is their first game. The second problem is that the genre has been confined to the Nintendo DS, denying PSP fans the opportunity to experience the newest entries into this genre. Of course, with the PSP firmware being exceptionally easy to crack, one could point out that true fans of this genre could play The Return of Werdna or Shining the Holy Ark, but those would be grey-area legal aspects at best if you did that. The second problem is at least solved by the release of Class of Heroes, but the real question is whether or not we finally have a QUALITY entry into this genre for the system. Let’s find out. Welcome to Particus Academy, a newly opened school where your instructors will teach you how to be adventurers, brutally decimate legions of monsters and collect treasure. You can make up to 100 characters (but only use six at a time) with ten races and fifteen character classes. Of course, nearly all of this is ripped directly off of Wizardry with a few new choices added. This was a bit disappointing as I was hoping for something a bit more than plagiarizing a game that is over two decades old. Story is pretty much non-existent. What’s here is just filler between your long hauls within various dungeons. These range from quizzes about character classes to bringing the principal a new table. The latter I mentioned, is one of the last things you do before beating the game. To say your motivation and story bits are dull and boring is a massive understatement. As well, there is no characterization. Your created protagonists are two dimensional without any substance at all. They’re just killing machines. Your teachers are only a hair better, as they actually have dialogue, but they’re still shallow and lacking anything and everything to make you care about them. There is not a single character in the game that ever develops anything close to a personality. Again, I could go back to games like freakin’ Zork that had more story and character development than this. To call Class of Heroes a throwback to old school dungeon crawlers is an insult to the quality dungeon crawlers of yore. If you want a game from this genre with a great storyline, might I suggest tracking down Azure Dreams or downloading Shining In the Darkness for your Wii’s virtual console. They’re a fraction of the price and you’ll actually have a plot to go with your gameplay. I can’t really bash the static character graphics and the unmoving monster visuals in this game because this is pretty much standard fare for this genre. Even Wizardry: Tale of the Forsaken Land for the Playstation 2 stuck with this tried and true visual presentation. As such, I’m grading the visuals from that perspective. On one hand, the character designs are VERY generic looking. All your protagonists will have one of two appearances, based off of race rather than class. This is a big disappointment as if I made a Diablos Valkyrie, she still looked like a ninja. She would ALWAYS look like a ninja. Same with all male elves carrying a bow. Not only is this quite dull, but it’s a very poor decision. Portraits really needed to be based on class as often times your characters will be carrying items they can’t possibly weild in their current class. I’m sorry, but this is just stupid. Monsters however are amazing. Although many of them are just palette swaps, there’s a lot of originally to the monsters you encounters. Some of these creatures I’ve never encountered in an RPG before. Things like living demonic coins or aquatic bumblebees. This was a lot of fun to see what weird monsters would be thrown at me next. Even classic monsters like goblins had a fresh overhaul compared to how they normal appear. Backgrounds are…mediocre. There’s not a lot of detail to them and each dungeon is pretty repetitive. Even dungeons crawlers from the 16 and 32 bit era really mixed things up a lot more in this regard, so once again, Class of Heroes is pretty disappointing. After all, as this is from a first person perspective, 95% of what you are looking at throughout the entire game are the backgrounds. If you’re looking for some sort of animation, you’re only going to find it with spell effects or in the opening animated cut scenes. Other than that, it’s all static images. If you’re well versed in this genre, this should be acceptable to you. Still, the character designs and backgrounds are lackluster. At least the monsters are some of the neatest designs I’ve ever seen in this genre. Just transplant them to an actual GOOD game, and I’d be happy. I enjoyed most of the score for Class of Heroes. Nothing here was truly amazing, nor will I ever be hankering for the soundtrack, but the music fit the tone of the game nicely, and that’s all I can ask for. Sound effects were mediocre. You’ll occasionally encounter a strange monster noise as an indication that you are getting closer to a battle. Other than that the majority of the noises in the game are your characters walking the occasional splash of water, a magic spell taking effect or something hitting something else. There’s not a lot of variety, even compared to once again, dungeon crawlers a decade older or more, but that seems to be the running theme of Class of Heroes, doesn’t it? Then we have the voice acting. On one hand, it’s nice to see the Japanese voice acting left intact for the game. On the other, Class of Heroes boasts some of the worst and most annoying Japanese voice acting I’ve heard in quite some time. Although you’ll only hear the voice when a character gets hurt or dies, it’s still more than you’ll ever want to. They not only grate on one’s ear, but the same few voices are used for multiple characters meaning it’s repetitive as well as poorly acting. As such the annoyance factor multiplies. There’s just not a lot of quality in the auditory department with this game. At best it’s acceptable. At worst, it’s annoying. 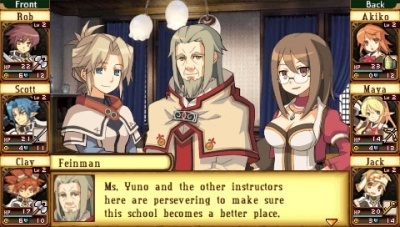 It amazes me that Class of Heroes could try so hard to be a blatant Wizardry rip-off and yet messes up everything that makes that venerable series classic while adding new things that make this game simply the worst dungeon crawler I have ever played. First up – character classes. There’s not enough to make the classes distinguished from each other. As well, the ability to carry over magic spells from one class to another, but not SKILLS is a horrible decision. There’s generally only one or two magic spells worth keeping in each level anyway, whereas skills are the more interesting aspect of each character class. As such, if you switch character classes around, everything starts to blur together and everyone ends up looking quite the same. Dull, dull dull. Then there is the alignment system. In other, better made dungeon crawlers, your alignment can change based on decisions your party makes. You know, ROLE-PLAYING. Here, that doesn’t happen. So instead of having a once evil Ninja turn good via character growth, your ninja will always stay evil and without personality. You can change your alignment via hypnosis in the principal’s office, but it’s a random change, which neither makes sense, nor is any fun. There’s also the insane decision to have both random battles and set battles that you can avoid. Random battles of course happen randomly, but there will also be a graphic of two crossed swords in the dungeon at various places. Step on this to trigger a battle against randomly chosen monsters. Step around it to avoid. Zerodiv really should have picked one or the other. If you’re doing a game with random battles, then the only set battles should be boss fights. The best way to do dungeon crawlers is generally where you have a set number of monsters on the floor moving around as you do. If you encounter each other, then great; it’s fight time. If not, life goes on. Zerodiv also couldn’t make up its mind as to whether or not it wanted to be a roguelike or not with randomly occurring dungeons or if they wanted to have set dungeons that you would map out as you explored them. As such, you are given a compromise – a set of three randomly occurring floor plans for each base level of the dungeon. Then you have an inner sanctum floor which always stays the same. 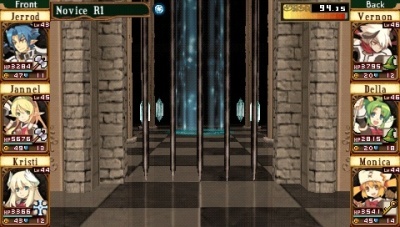 You have to map out each of the random floors however, which you can then view OUTSIDE the dungeon, but not in it unless you buy a map. If you buy a map, it still only shows where you have been, which is yet another example of amazingly stupid programming on the part of the developers. You’re paying money to be able to carry the partially created map you have already made into the dungeon? Then how did you make the map in the first place. Jesus, there are so many stupid things wrong with this game, it’s mind boggling. Healing is another strange duck. Let’s say your team has just come out of a battle. Well it’s 100GP per character to heal yourself back up. Not to shabby. Well, gold is VERY hard to come by in this game, especially early on. We’re talking 1-3GP a battle if you’re lucky. HOWEVER, resting and recharging all your magic spells is free. Any cleric can cast four level 1 spells before needing to recharge, so just use your cleric to heal everyone. If he runs out of juice, let him rest for free, then cast spells again and rest up so he’s ready to go back to the dungeon. Wow. You’ve just totally bypassed the whole Inn aspect of the game thanks to an oversight that really shouldn’t be there. An exploit like this really shouldn’t be in the game. Really, who the hell doesn’t make a RPG party without a freakin’ cleric? Yet another horrible planned move by Zerodiv. Either make the game hard all around or be nice to the gamers when you’re back at camp. Don’t have the game be wildly unbalanced in two extremes at the same time. As long as we’re on the concept of things costing money, it really is insane how much things cost and how little you get for selling. I’m sure this was done in an attempt to make the game “harder” but there’s a difference between making a game challenging and make a game monotonous. By having even the most basic provision be extremely expensive, gamers are forced to level grind (or as we called it back in the pen and paper days, munchkin) in order to buy anything. This means by the time you’re able to afford a basic weapon, you should have enough parts collected from chests and battles to make the item in the alchemy lab. As the level grinding has to occur in dungeons you’ve more than likely already thoroughly explored, it’s back to the same bad backgrounds and the same boring combats where more than half the moves you or your opponents make are misses. The sheer amount of missing combined with the copious amount of battles you have to do to afford anything means this game gets old and boring fast. Even before you complete all the intro quests, you’ll find overpowered compared to regular dungeon opponents but still unable to afford say, a long sword, the most basic and generic weapon in all of RPG’ing. A big problem with the game is everything costs too much money for the amount you get in the game and that EVERYTHING costs money. Want a map to see where you’re going? You have to buy it even though you’ve already made it and it’s there in the library for you to look at? Want an antidote to poison seeing that poison traps are the most common in chests? Well, it’s over 200gp for one and for some reason antidote spells are 5th level spells which means you’ll be playing the game for quite some time before you get one. Have fun with that! Alchemy is exceptionally boring too. There’s no real thrill to it. It’s just putting in a bunch of items you find in the dungeons and combining them. Most of the time things you find are weaker than what you already have so you’ll be combining, combining and combining some more and then combining those creations together to make anything halfway decent. Again, this is time consuming and more likely than not, like the Star Ocean games, you’ll spend more time synthesizing crap rather than actually playing the game or doing anything interesting. What it basically comes down to is that the game is just way too slow in terms of progression. I was twenty plus hours in before I had even finished the tutorial missions in Class of Heroes. I’d beaten the first principal assigned boss but I was still stuck on Mystic Arts II because I couldn’t get a bloody broken slingshot to show up randomly in treasure or spoilage. Without this you can’t proceed and the appearance of this is so random, it’s frustrating. By the time I FINALLY got this item (Don’t trying buying one. The game knows. You HAVE to find it in the dungeon, which is yet another stupid decision and a way to increase time spent on the game without anything interesting occurring), my characters were so overpowered I basically slaughtered everything in sight for the next two chapters without any strategy. 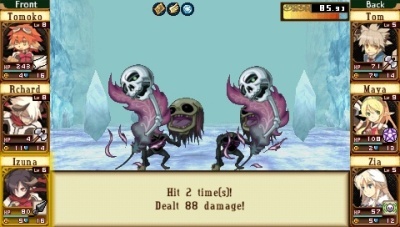 When my freakin’ Sprite Mage is occasionally one-hit KO’ing a monster, there’s a huge problem with the design of the game. In short, Class of Heroes has a LOT of potential, but it’s such a badly broken game in nearly every way, it’s impossible to have fun with it. There are countless programming and design flaws in here that are common sense “WTF?”‘s to anyone who has played a decent amount of dungeon crawlers. Zerodiv obviously did little to no playtesting on these games otherwise 90% of this game would be overhauled for better playability and balance. Zerodiv has given us a dungeon crawler where the game is far less about exploration and hack and slash than it is mindless repetition and saving your gold like a young Scrooge McDuck in the Klondike. 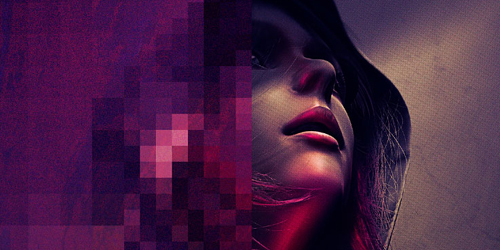 The emphasis was on making the game as lengthy a process as possible instead of a truly enjoyable one. Going into the same dungeon twenty times in order to get enough gold for an item or even a potion is neither deep nor challenging. It’s a time sink better spent on games with actually story progression, character development or a more interesting battle system. One of the nice things about Class of Heroes is the illusion of length. The game actually isn’t that long or deep, but because you’ll have to go into the same dungeons multiple times in order to make any progress via purchasing things, the game gives an illusion of being really when really you’re just level grinding. Still, this is easily a 100 hour game, and even after you beat the game there are new “quests” that you can take part in. You can also do any quest you want in any order you want, within reason. For example, the game is divided into sections. Let’s start with the intro aspects of the game. You have various classes like Mystic Arts, Healing Arts, Fighting Arts and the like. You have I, II, III versions of the class, which are basic, intermediate, and advanced. 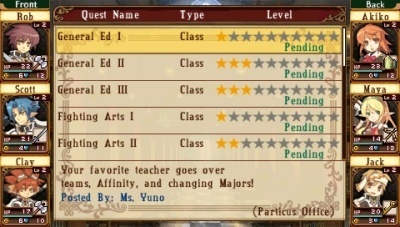 If you want, you can do Fighting Arts III before Fighting Arts I. Things like that. The game advises against it, but at least the option is there. 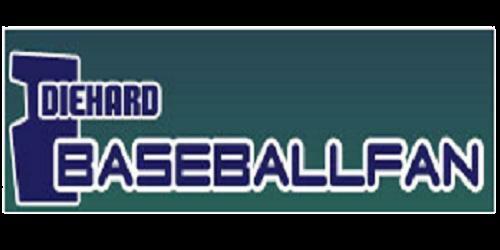 You can also make 100 characters per game. This gives you a lot of flexibility with your teams. You can mix and match characters pretty easily throughout the game, or just create a lot of different teams. Of course it’s preferable to stick to your main team of six as characters that stay together gain cuts down on your affinity for each other. The more you keep a team together, the better they perform. On one hand this is a nice little bonus for sticking with selected characters, but on the other, it drastically reduces your ability to experiment and switch out characters at the drop of the hate. If you were hoping for the normal flexibility of quality dungeon crawlers, you don’t get it here. This is another example of an idea that sounds good on paper but just doesn’t work when actually implemented. For a GOOD example of how this system should work, try Shining Force III. Overall, you can get a lot of play value out of a single playthrough. Would you ever bother to replay a game that takes forever to advance in, offers little to no reward and lacks all but the shallowest story hooks to keep you engaged? No. This game is a one shot playthrough IF THAT, but at least that first playthrough will keep you occupied for a long time if you can stomach the game. Take character creation. Like most dungeon crawlers your starting stats are based on your race. You then get bonus points to pump into stats to help you qualify for other classes. Neat, right? Well, unlike most dungeon crawlers, Class of Heroes has a very exploitable bug that most powergamers will take full advantage of, further reducing the alarming lack of challenge in this game has. The first character I made was a Diablos Mage. I had wanted to make a Diablos Paladin, but I couldn’t get the points. I had eight bonus points. The next character I made had ten. The third character got eighteen. I was like, “Neat.” Because I had obviously gotten a rare luck of the draw and used those points to make what i thought was a powerful character. For the sake of the review, I decided to see how high I could get my bonus points up to. Five rolls later I had a character with TWENTY EIGHT BONUS POINTS. That is insanely powerful considering each stat point you jack up has a noticeable effect. I continued on. A minute later I had 37 bonus points. This allowed me to make a Drake Warrior whose starting Strength and Vitality were both at 30. Drakes have the highest in these categories anyway and they start at 14! As you can imagine, this guy slaughtered everything he came across. He had a Strength and Vitality most Drake Warriors wouldn’t have until around level eight. Because they type of person who would actually have fun with doing the same damn dungeons after you’ve completed the quests in them would be the same person who would keep rolling until they powergamed their character, it means a lot of people who “enjoy” this will be making crazy beefed up characters. The highest bonus roll I got was a 47 by the way. I got my Diablos Paladin at level 1, which would be an assured impossibility in any well balanced, properly designed dungeon crawler. Then there is the artificially induced length. Anyone who tries to tell you that this is normal for dungeon crawlers is either an idiot, a liar, or ignorant. Dungeon Crawlers have always been challenging, but they have never padded their length by limiting gold and giving you crazy easy battles. In fact, the best dungeon crawlers enforce TIME LIMITS. The Bard’s Tale Dilly-dally too much and you get dopplegangers. Eye of the Beholder? YOU WILL STARVE TO DEATH. Games like Wizardry IV had KEYSTROKE limits! Class of Heroes completely misses the point of why the classic dungeon crawlers are so revered. It decides to go in the exact opposite direction of what makes these games truly special and as such, is a broken unbalanced mess. Finally the game is just too bloody easy. Rank and file monsters offer no challenge except for the fact you can’t specify which monster you want to attack. You can only choose a line of monsters based on what your weapon can reach. Bosses are more powerful than what else lies in the dungeon, but by the time you reach one from all your forced grinding, you’ll find you don’t need to grind to beat them. 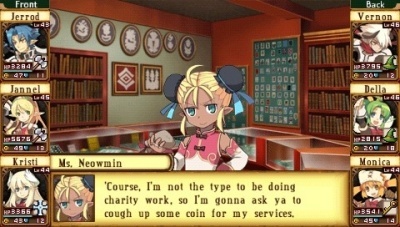 I think they only time I had a challenge was with the boss of Thievery Arts III and that’s because you get the “intimidation” status from him, so you can’t use magic. Oh well, I just had to used my beefcake warrior with the crazy extra bonus points. He and my Dwarven Paladin slaughtered him, although my magic based character did die. Finally, I’ll give you one last exploit that makes the game way too easy. Characters you make are level one and have no money or equipment. However, there are a dozen premade characters. You can have them join your team, steal their stuff and money and boot them out giving you homerolled characters a leg up. Considering the premade characters have awful stats but nice stuff and money, this again is ay too another cheap exploit giving you way too large an adventure. Seriously, Class of Heroes offers no puzzles, challenges, or competent. It just offers you a lot of monotony. 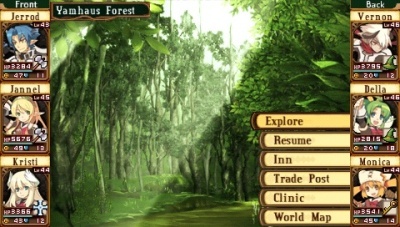 The only thing truly original about this game is that it uses a university type setting as the springboard for your adventures. It’s a twist to be sure, but with the lack of characterization, depth and intrigue these games usually have. What really annoyed me is that aside from this and the pretty far out monster designs, EVERYTHING else about the game is cribbed from something else. 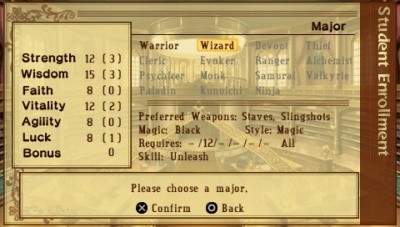 In fact, some of the character class requirements are taken stat by stat from the Wizardry games. I even found one or two of the levels in the game to follow the same pattern as some old SSI levels. Coincidence? I strongly doubt it. When I’m running a maze I’ve supposedly never been in before and halfway through I have severe deja vu from the layout, something stinks. You know, I really REALLY wanted to like this game. I love dungeon crawlers. I’ve been playing them since single digits and as new ones hitting stateside are so rare, I pick up every one that comes out. There’s something about a nice first person perspective where a team of homerolled characters wander aimlessly through a troll or ogre filled dungeon that gets my juices flowing. Class of Heroes though. Easily the worst game in this genre I have ever encountered. 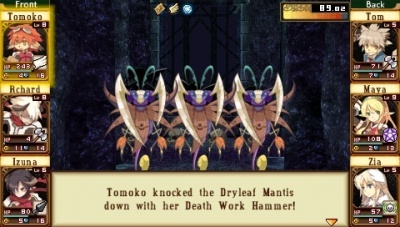 For most of the intro missions I was having fun discovering all the exploits and bugs and severe issues with the game, but I was also having fun discovering dungeon layouts and wondering what weird monster I would encounter next. As the game progressed slower than any dungeons crawler in history, I began to have a lot less fun with the games and the glitches and exploits became so noticeable, each foray into the dungeon ended up being so that I could write an informative review rather than having fun. Usually these games are addicting from beginning to end, but without any real story or challenge it became tedious. If you have severe OCD or you’re one of those gamers that is more than happy to do the same thing ad naseum in the time you could spend beating ‘ll probably have a quality game, then you’ll probably have no problem wading through a dungeon for the umpteenth time hoping that finally a random piece of junk will appear so that you can make a particular weapon that your characters are so overpowered for now anyway it’s just going to make your dominance all the more sad. Class of Heroes has been getting trashed left and right, and rightly so. It’s a poorly made game in nearly all aspects. Dungeon Crawler fans in the US are even rarer than Shoot ‘Em Up and Dating Sims audiences. The hilarity? Any long time dungeon crawler fan worth their salt is going to spend twenty hours with this game and realize it’s the antithesis of what this genre is supposed to be in nearly every way possible. The only people that are going to have fun with this are mindless Atlus zealots who buy everything they put out, or people who are so desperate for a dungeon crawler because they don’t own a DS and thus can’t experience The Dark Spire. Everyone stay far away from Class of Heroes because it will taint your memory of this usually stellar genre. At the end of the day, even with the bugs and exploits that saturate Class of Heroes it IS a playable game. It’s not going to crash on you or anything. It’s just simply the worst version of a dungeon crawler I have played since the horrible sin against nature that was Sting’s remake of Wizardry for the Wonderswan. At least Sting still got the basic tenants of the genre right. Look, if you’re one of those gamers that spends hours getting your characters into battles so you can be crazy leveled up and streamroll over bosses, you’ll probably have fun with this. If you don’t care about story in your RPG’s and just like mindlessly choosing commands from a menu instead of having strategy, then this is right up your alley. If you actually like it when programmers make insanely stupid decisions that you can powergame with, you’re going to have a harder time find a game that lets you do that better than Class of Heroes. If you are a long time fan of this genre, remembering when it was THE subgenre of choice for RPG’s and actually the cornerstone of PC gaming, you want to stay the hell away from this as it’s a kick to the nuts of even the mediocre games in this genre. I’m really disappointed that the first entry into this genre for US PSP’s happens to do everything wrong and barely anything right. It’s playable and it’s functional, but all Class of Heroes was good more was turning on my Sega Saturn, putting in Shining The Holy Ark and treasuring the nice collection of awesome games I have for this genre. I guess in that respect, Class of Heroes has been good for something. Class of Heroes is easily the worst dungeon crawler I’ve ever had the misfortune to experience. Everything that games like The Bard’s Tale, Eye of the Beholder, Shining the Holy Ark and Revenge of Werdna did right, this game does horribly horribly wrong. There are far too many bugs and exploits in the game, ensuring that once you discover them, your characters will cakewalk through the game. The story is nearly non-existent, which is a death knell for any RPG. Characterization for your NPC’s suffers the same fate, which is a huge red flag for ANY dungeon crawler as this is where you tend to get any personality development. The third and fatal strike comes with the alarmingly slow progression of the game. This is not from challenging battles or befuddling puzzles as both of which are all but absent from this game. Instead it comes from the artificially lengthened time it takes you to accumulate gold or items needed to achieve quest goals. Without either of these issues the game, would be as quick as it is mindless and easy. If you own a DS, run from this burrow show and embrace The Dark Spire or either Etrian Odyssey for they’re as close as we’re going to get in 2009 to the true quality titles of this genre. As for me, this game has left me so disappointed, I’m going back to Skara Brae and lose myself in Thief of Fate.